Arms: Gules, 3 crescents or. Motto: ‘Mediocria Maxima’ translated as the middle way is best. The arms are an example of heraldic ‘punning’ i.e. three little moons or crescents ‘moonings’ Monins. 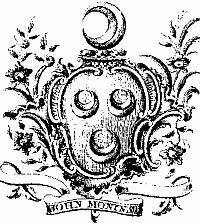 The family name has been spelt in several ways over the years Monyn, Monyns, Monyng, Monin and now Monins.The Monins Family have long been connected with East Kent, and can trace their roots in England back to the time of William the Conqueror. The founder of the family was Sir Symond de Monyn of the castle of Mayon in Normandy, who accompanied Duke William on his expedition to England in 1066, his grandson Sir Alexander Monyn became possessed of the estate of Poulton near Dover and the family settled in Kent thereafter. Sir Alexander's great-great-grandson, John Monin of Dover, married Joanne, the daughter and heiress of Sholden, and the family adopted this as their residence at what is now Hull Place. One son John was a priest described as a ‘parson of Deal. This estate stayed in the family until it was alienated by one of them to Sir William Crayford of Mongeham. Several members of the family were members of Parliament for Dover: in 1368 Simon Monin sat in the Parliament of Edward III, ten years later John Monin was a member in the time of Richard II and finally in 1413 Thomas Monin sat in the Parliament of Henry V.
The Monins family rose in importance in the reign of Henry VI (1422 - 61) when by marrying the heiress of the Malmayns family, they became lords of the manor of Waldershare. They then acquired the manor of Swanton in 1463 when John Monins married Alice, daughter and heiress of John Greenford of Swanton Manor. John Monins must have been in good standing with the church, as in 1474 Pope Sixtus IV granted him a special indult to travel with a priest and a portable altar to celebrate mass on necessary journeys. This ‘Papal Bull’ is still in the possession of the family. His son, also John, died in 1526 and his tomb is the first of the family, which can be found in the church at Lydden. His two sons were Edward of Waldershare and John of Swanton. Edward married Parnell Leverick of Herne, where the Monins coat of arms can be seen displayed in the church, and from this marriage acquired Ridgeway in Herne. Later Henry VIII gave him the manor of Charlton in Dover. John of Swanton became lieutenant of Dover castle, he married twice first to Margaret Aldey of Checker in Ash and secondly to Jane Cranmer sister of the Archbishop. Edward of Waldershare's grandson, another Edward, was knighted, and his son William was made a baronet by James I, so the title descended through the family until it came to one Thomas Monins, great-great-grandson of John of Swanton, a wine cooper of Dover who refused to take the title. After his death in 1730 a descendant tried to claim the title but was unsuccessful. By this time the Waldershare branch of the family had died out and the Waldershare estate had passed by marriage to the Earl of Guildford. From 1328 onwards, members of the family were often mayors of Dover. In 1627, 1628, 1629, 1636 and 1637 Stephen Monin was mayor. The first year turned out to be most eventful, about three months before the mayorality commenced, Charles I, on the advice of the Lord Warden, the Duke of Buckingham, had sent from Portsmouth an expedition to Rochelle to relieve the Huguenot Protestants there. The force, which consisted of 100 ships and 7,000 land troops, commanded by the Duke, arrived at Rochelle but were refused permission to land. The authorities there suggested that they should take possession of the Isle of Rhe instead. They landed there but were soon compelled by the French to return to their ships with great losses, having accomplished nothing. Hoping to win some laurels before returning, the Duke sailed along the coast and summoned Sir John Hippesley, the lieutenant of Dover Castle, to consider a scheme for making an attack on Calais with the object of recovering it as an English possession. Eventually that project was abandoned and the troops were landed at Dover and the other Cinque Ports , where they were billeted pending arrangements to re-employ them again for the relief of the Huguenots at Rochelle. The troops became so troublesome to the inhabitants that a commission for enforcing martial law was issued to the mayors of the Cinque Ports. The mayors of the several ports were not only authorised, but urged to erect gallows and gibbets in public places and then hang the ringleaders to overawe the others. At Dover this thankless task devolved on Mr Stephen Monins in his first mayorality. Eventually Dover and the other Cinque ports were relieved of these undesirable visitors, who were marched away to Portsmouth to embark for another expedition to Rochelle; but on the morning of his intended embarkation the Lord Warden, the Duke of Buckingham, who was going to lead the expedition, was assassinated by John Felton, and the expedition was abandoned. Sir John Hippesley, the lieutenant of Dover castle and an M.P for Dover, was standing beside the Duke when he was assassinated. His public conduct was attacked in Parliament and he retired from public life. Under the next Lord Warden, Stephen Monin the mayor, also became Lieutenant of Dover castle following in the footsteps of his ancestor John Monyns who with Richard Dering was Lieutenant between 1536 and 1558. The Lieutenant was the chief administrative officer, who assisted the Constable when present, and in his absence was in supreme command. Very few of the Constables took up their permanent residence in the Constable's Tower, the Lieutenant being the regular occupant of that part of the castle…on the Lieutenant fell the duty of hearing at the castle or St James's church cases that were referred to him by the inferior courts of several ports and ancient towns. The Lieutenant's military control of the castle ceased in the 17th century when the garrison was composed of regular troops under their own officers. Captain Thomas Monyns had received a commission from Oliver Cromwell, which is still in the family's possession. When in 1644 Parliament abolished the deans and chapters of cathedrals and their revenues were sequestrated for the use of the State, Captain Monyns was appointed treasurer-general. The government committee at Canterbury took possession of the precincts and cathedral. Captain Monyns appears to have been a Royalist at heart, and owing to his influence managed to save the building from destruction and kept it in good repair. He ceased to be treasurer -general in 1649 as the State had passed another ordinance for the sale of all cathedrals. Canterbury cathedral was valued but somehow escaped being sold. When in 1660 the monarchy was restored, Thomas Monyns, who was then a captain of a troop of horse, petitioned the King to keep his position, citing the assistance that he had given to the cathedral. His Majesty, however, refused his request. 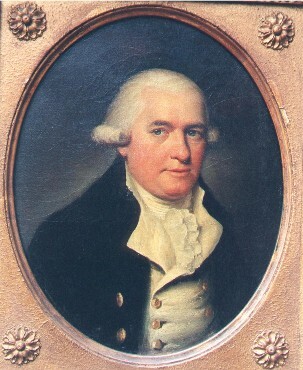 The connections with Ringwould began with the Reverend Richard Monins MA (born 1692), son of Thomas Monins of Dover and his wife Mary, sister of Sir Peter Eaton, Kt., and a descendant of John of Swanton. Richard had been a scholar at the Kings School, Canterbury, after which he then went on to Jesus College Cambridge. 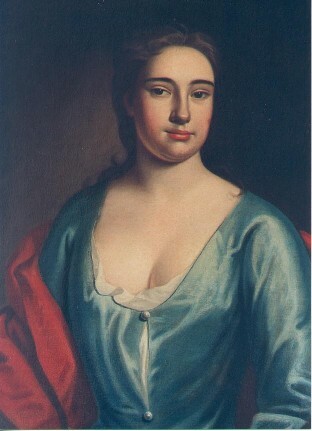 In 1727 he married Mary Dauling daughter of John Dauling, the rector of Ringwould and vicar of Alkham. By this marriage he obtained the advowson or patronage of Ringwould and Charlton in Dover, that is the right to appoint the rector to the parish. This was valuable as it entitled the rector to collect tithes from those parishes. Church records show him as rector of Ringwould in that same year. In 1734 Richard was appointed as headmaster of the Kings School, Canterbury. He was at this time the incumbent of Ewell and Alkham near Dover as well, although these must have been served by curates as he seems to have spent his time attending to his scholastic duties. He was clearly a good headmaster as after only two years of his headship the number of boys in the school had increased so much he was allowed to engage an assistant at his own expense. In 1747 he was forced to resign as headmaster due to ill health. He was then made a Prebendary of Bristol and died in 1750 at the age of 57. He was buried at Charlton. On his father's death his eldest surviving son the Reverend Richard Monins Eaton, who had changed his name to Eaton at the request of Peter Eaton Esq. of Woodford in Essex, became rector of Ringwould and Charlton. He died unmarried at the age of 36 in 1770 and was buried at Ringwould. His memorial tablet is on the right-hand side of the chancel. John Monins, his brother, we shall call him John of Canterbury to distinguish him from the other Johns, then inherited the patronage of Ringwould. John was a most interesting character. Born in 1741 he had joined the Royal Navy as a midshipman, and served at Lord Hawke's battle against the French Admiral Conflans off Belle lsle in 1759. In that same year he quit the Royal Navy and obtained a commission in the 60th Regiment known as ‘the Royal Americans’, and later exchanged to the 43rd Light Infantry Regiment which was also serving in America. He was about to buy his company when his elder brother died. 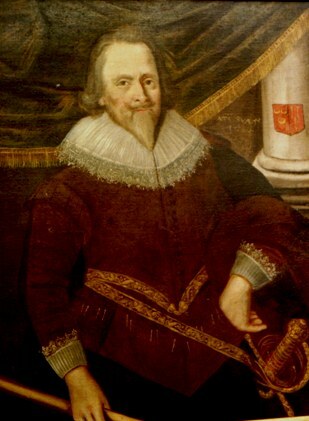 John, immediately retired from the army and took up residence at Woodford in Essex where he had inherited property as well as the advowson of Ringwould. In 1777 he bought a property in Canterbury called the Archbishops Palace on which he built a mansion called ‘the Palace’. He was also the heir to Hannah Eaton who died in 1778, and clearly was a very wealthy man. John of Canterbury later married Sarah Trice, more than 20 years his junior, and the couple had six sons and two daughters. All but the two last born sons survived into adulthood, and three sons Richard, William and Eaton, followed in their fathers footsteps into the army, Richard further emulated his father by first joining the Royal Navy and after four years transferring to the Army, serving under Wellington in the Peninsula War when, after the retreat from Corunna, he was compelled to quit the service due to ill health. Eaton in the 52nd Regiment, and William with the 18th Hussars were present at the battle of Waterloo. William became the first member of the family to reside in Jersey, retiring there on half-pay after the battle. 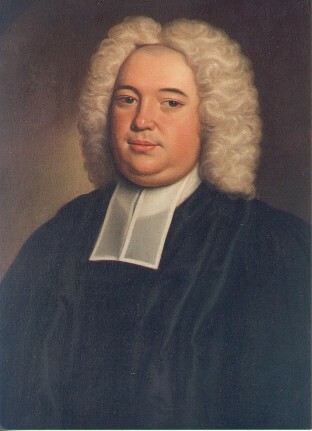 The eldest son John, however, had followed the other family tradition and joined the Church. John of Canterbury died in 1806 and was buried at Ringwould. In 1811 his eldest son the Reverend John Monins, at the age of 25 became rector of Ringwould where he was to remain for 42 years. The Reverend John started by commissioning Sir John Soane, architect of the Bank of England, to build him a new rectory, the present Ringwould House. The parish registers record that the foundation stone was laid in 1813 by him and his brother-in-law Thomas Hastings. In 1837 he purchased the ‘Manor of Ringwould’ from the sons of Captain Poynter of East Bottom. Thus by the time of the drawing of the first tithe map in 1839 the Reverend John was both lord of the manor and rector, and the largest land owner in the parish. He had six children by his wife Mary Lee Carter, daughter of a doctor of Kennington near Ashford, of whom four survived into adulthood. His daughters Georgiana, Mary Harriet and son John were all to die unmarried, but his eldest son the Reverend Richard Eaton Monins had married Emily, daughter of the Reverend John Chevallier of Aspall Hall, Suffolk in 1847. The Reverend John planned that Richard, who was at the time rector of Glemham Suffolk, should succeed him as rector of Ringwould, and at his own expense in 1851 he started to build ‘Glebe House’ (now Ripple Down House) as a new rectory for him. Sadly in 1852 Richard died, before the house was finished, and only a year later the Reverend John also died. The Reverend John Monins had changed the face of the village and for the first time for many years the ‘manor’' did not have an absentee landlord. He also built the first school, a Sunday School which started in 1852, in the purpose-built building in Church Lane. The heir to the Reverend John Monins was Richard's son John Henry Monins, who was only two years old when his grandfather died. His mother brought him to live with her at Ringwould House, but the estate was in trust until he was 25 years old. He was educated at Eton, and then spent a short time at New Hall, Oxford but he did not take a degree. He left to travel to India, and followed this by visiting Russia. When he attained his majority in 1876 his mother moved to the dower house ‘Holly Cottage’ now ‘Ringwould Cottage’ which she sometimes shared with her two spinster sisters, the Misses Chevallier. John Henry, known in the family as 'Joe' was an eccentric and much loved figure. He married Edith Julia Cobbold in 1885, and had four daughters and one son. He it was who extended Ringwould House and built a conservatory. Stories abound of him wandering around the village rather scruffily dressed, but he clearly cared for his tenants, and he was often late for his Christmas lunch as he insisted on visiting them all beforehand. He apparently disliked ‘dinner parties’ and would retreat to his study with egg on toast leaving his wife to entertain the guests. John Henry Monins was a respected figure in the community as an alderman of Kent County Council, and a local magistrate, not to mention an Honorary Major of the East Kent Yeomanry. He was much involved in all aspects of the life of East Kent, supporting county and village cricket, and as a farmer of 500 acres himself, the East Kent ploughing matches which are still held today. John Henry Monins died following an operation in 1920 at the age of 68. He was buried in the churchyard, and on the day of his funeral the church overflowed as it seemed that half the county had come to pay their respects to this much loved figure. 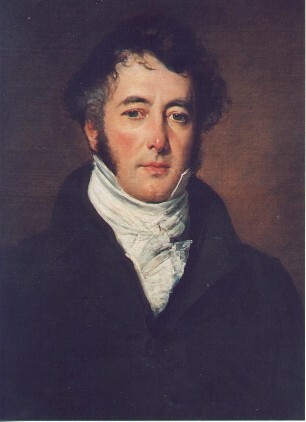 His son John Eaton Monins then inherited the estate. Of his four sisters Margaret Mary had died in 1909 aged 13 of Hodgkins disease. The eldest Adela had married the nephew of Lord Kitchener, Eleanor had married Major A. C. Bovill and only the youngest Bridget remained at home at the time of her fathers death. Bridget married Ralph Toynbee in 1925. John Eaton Monins, born in 1890, had a BA from Balliol College Oxford and was a qualified barrister. During the First World War he had served as a staff officer in India whilst a captain in the 1/4 'Buffs'. He again visited India in the 1920s and there met Margaret Carter from St Louis, USA who was travelling with her father. 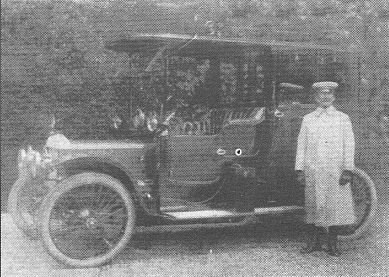 The couple married in St Louis in 1926 and returned to Ringwould. The years that followed were not always easy, Ringwould being affected by the great depression as much as anywhere else. New fund-raising ideas were tried and the Kelly's Directory for 1930 and 1934 lists ‘Eaton Antiques’, Antique furniture dealers at Ringwould house. Ian Monins recalls that the house was often full of items awaiting shipment to the USA, where most trading was done. Captain Monins was killed in a motor accident in 1939, and the estate was then run by trustees as both sons were only young. 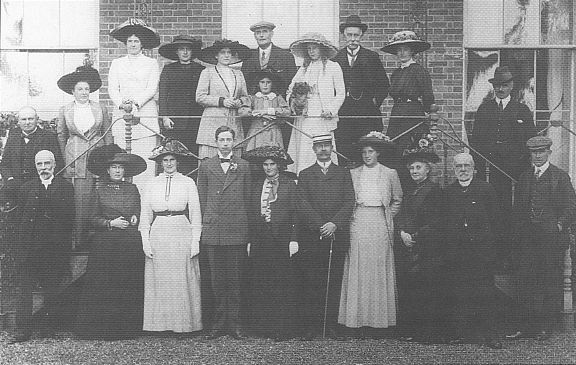 John Eaton Monins - Coming of Age 1911 Centre Front: Edith Julia Monins, on her right, John Eaton Monins, on her left in Boater, John Henry Monins, Adela Broome. 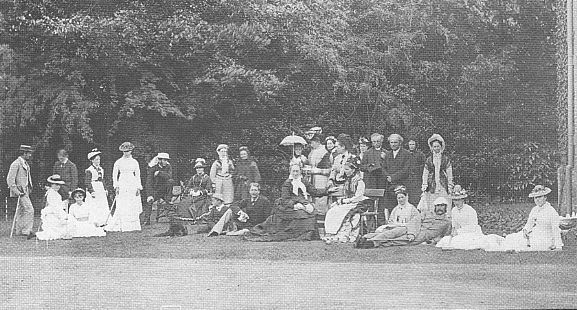 Rear Centre child, Bridget Monins, on her left with dog, Eleanor Monins. Captain Monins had two sons Ray Stephen Carter Monins born in 1927 and Ian Richard born in 1930. Ray lived in Ringwould House until it was sold in 1981. He moved to the Island of Jersey with his second wife Suzanne, and later to her home state of Tennessee, USA. He died in 2011. Ian lived in Jersey for 30 years, until he also died. 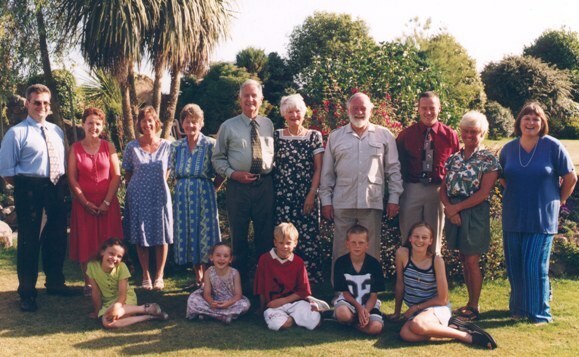 He and his wife Pat have four children and five grandchildren so the future of this branch of the Monins family is assured, the current senior member of the family and holder of the Ringwould Church advowson is Symond Richard Monins who lives in Jersey. Although the family are no longer the largest landowners in Ringwould, the family remain in possession of the Lordship of the Manor, retaining an interest in the village where the name Monins held sway for so long. An earlier version of this article was first published in 2000 by the Ringwould History Society.